If you haven't yet planned a decadent dessert to share with your loved one(s) this Valentine's Day, not to worry. 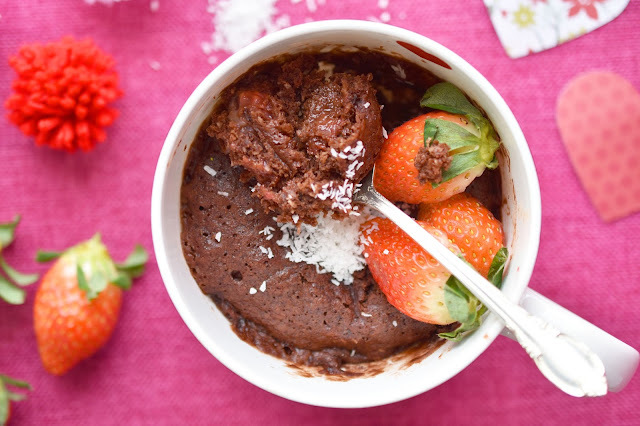 This Coco Chocolate Berry Mug Cake can be whipped together in minutes! And you can make as many as you want. 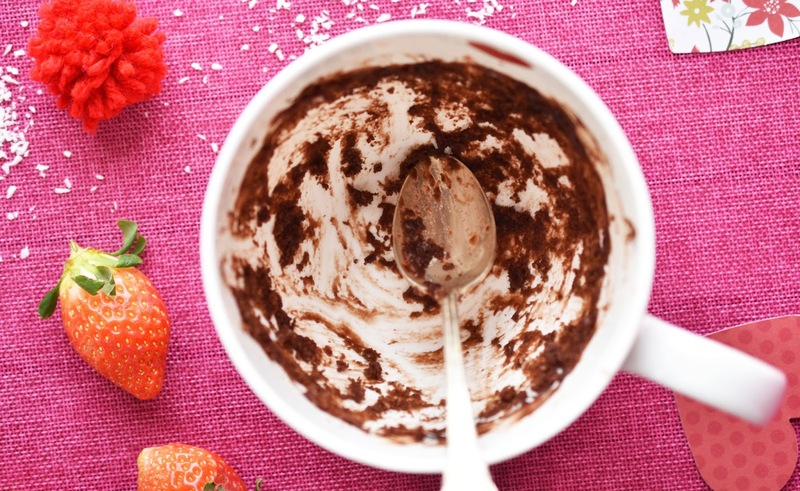 If you plan to curl up on the couch by yourself to watch Bridget Jones, make just one mug cake. In that case I recommend adding coconut whipped cream and chocolate drizzle on top too. Nobody's watching. 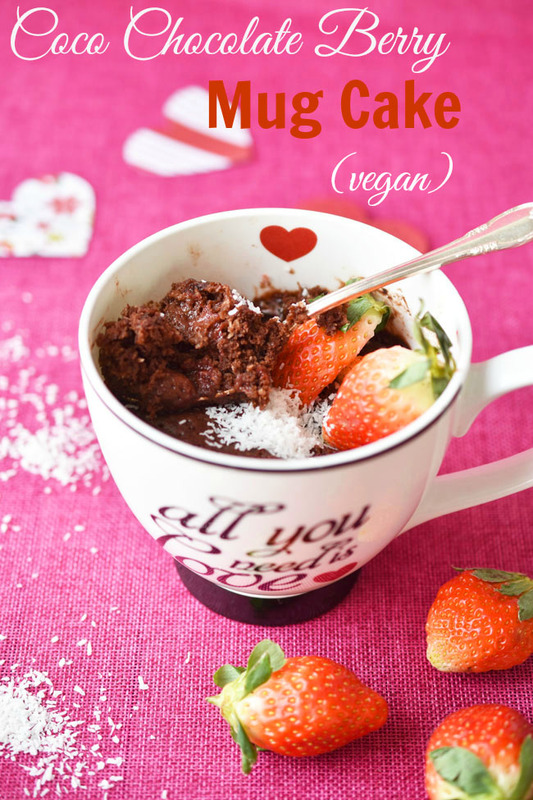 If you are celebrating Valentine's Day with a partner, line up two mugs and repeat the recipe in each. If you have kids, get them to make their own mug cakes. 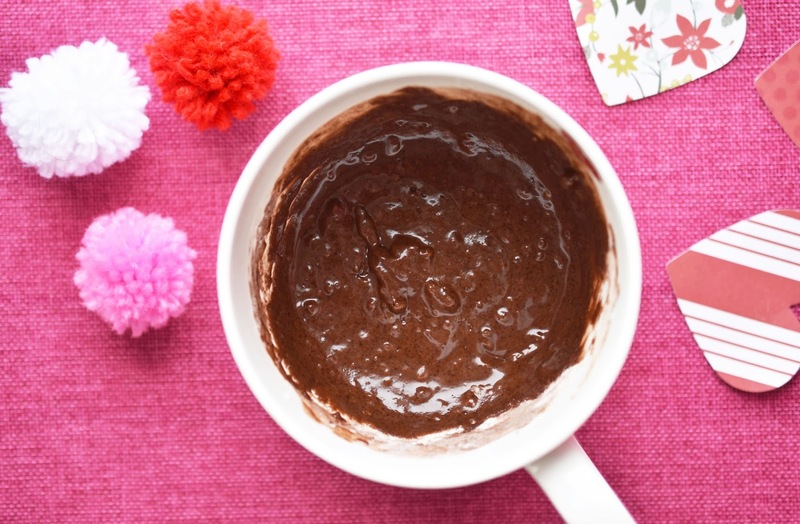 My kids love creating mug cakes - especially since they can be eating a rich, chocolate dessert in mere minutes. 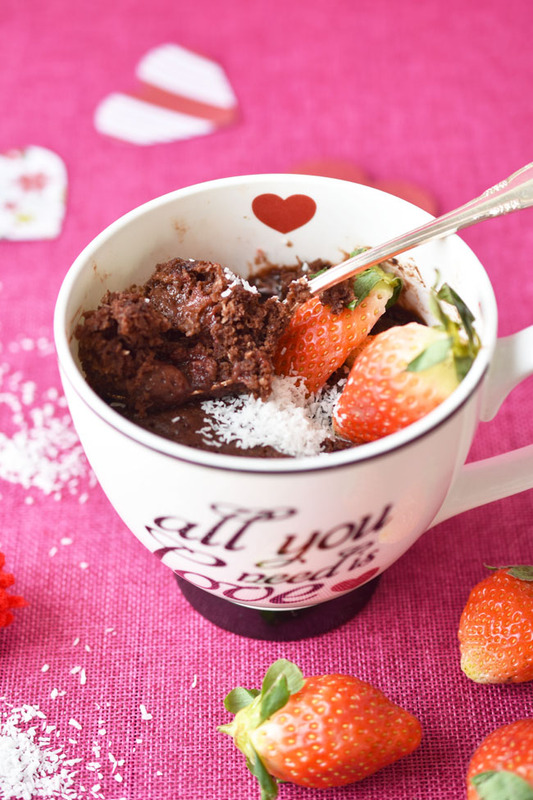 I was inspired by a recipe for chocolate mug cake with mayonnaise that I saw in a book called Mug Cakes: 100 Speedy Microwave Treats to Satisfy Your Sweet Tooth . I decided to "veganize" the recipe by using vegan mayonnaise. I also reduced the sugar, adding more natural sweetness with lovely sliced strawberries and flaked coconut. The strawberries make a nice taste sensation within the cake once it's cooked. I confess I'm not a big fan of the microwave. I even keep ours in the basement. But I admire the convenience of having a cake on the table with just two minutes of cooking. If you've never made a mug cake before, you will marvel at how authentic a cake it ends up being, with a firm top and a rich, moist middle. 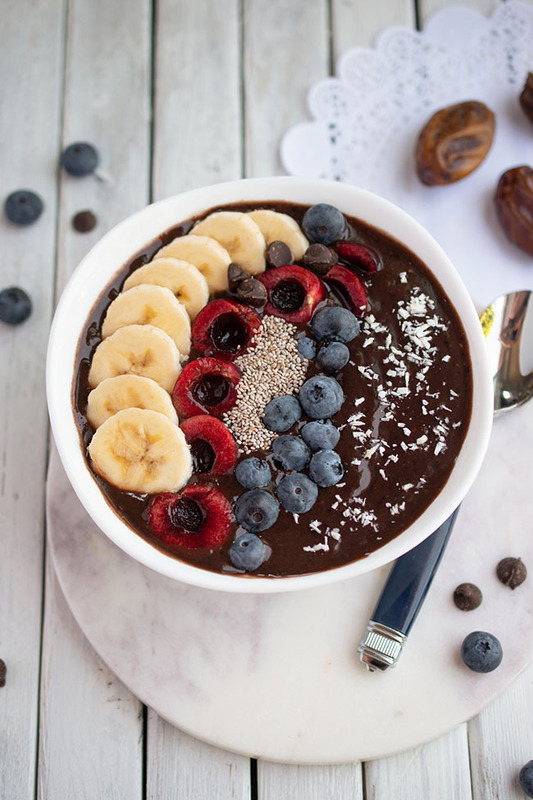 This Coco Chocolate Berry Mug Cake is heaven in a cup. Gift one to your partner, your parent, your child or a friend this Valentine's Day and they will no doubt feel the love. You know, I had to eat several mug cakes to test this recipe. The last one I ate mid-morning. I hope you appreciate the sacrifices I make in providing you with successful recipes. 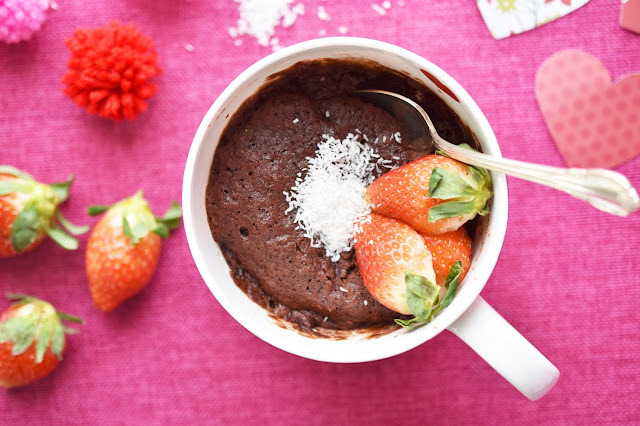 That mid-morning thing gives me an idea - I think this mug cake would be a great dish to serve to your girlfriends on Galentine's Day, February 13th. This is brunch food, no? Happy Valentine's Day friends! Peace and love to you. In a large mug, mix together vegan mayo and sugar with a fork. Stir in water and vanilla. Add cocoa, flour and salt. Whip together with fork until smooth. 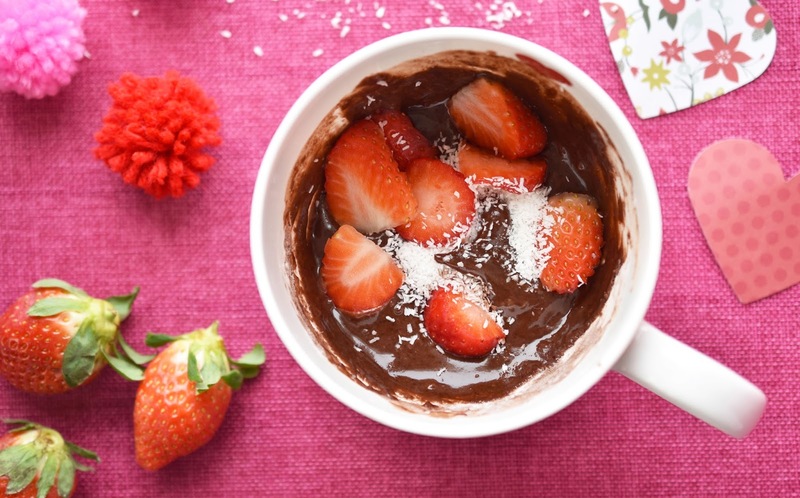 Stir in strawberries and coconut. Microwave for 1 to 2 minutes (depending on the power of your microwave) until firm to the touch. 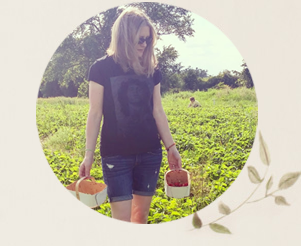 Looks awesome Jo! Will have to give this a try for sure;) happy valentines!